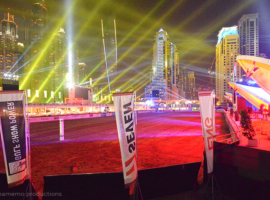 Dubai, May 2014 – For the 10th edition of the Beach Polo Cup Dubai, event partner AO Technology supplied FALCON® searchlights to illuminate the event arena on the premises of Skydive Dubai and provide special highlights. 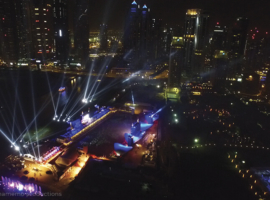 To mark the 10th anniversary, the organizers, mamemo productions, directed by Creative Director Sam Katiela (the founder and organizer of Beach Polo Cup Dubai), put on a tremendous show. 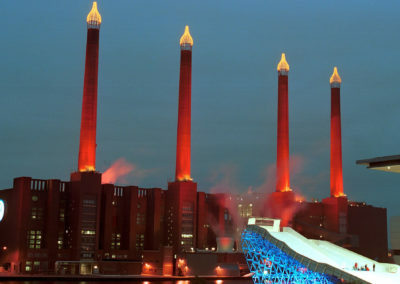 This was the first time the event had taken place at night. 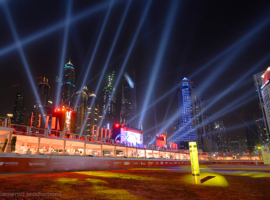 AO Technology illuminated the playing area against the magnificent backdrop of the Dubai Marina skyline using SKY FALCON ARC searchlights as floodlights. They were equipped for the purpose with special lenses to provide an illumination corresponding to natural lighting conditions. 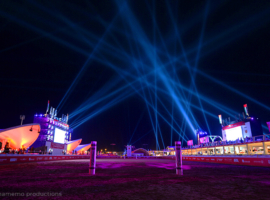 Meanwhile xenon searchlights created a canopy of light above the playing area. 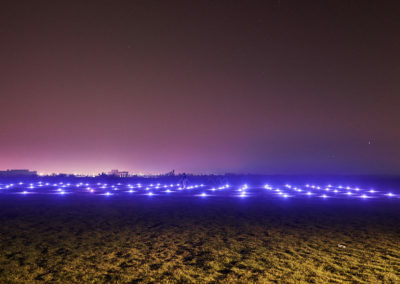 Each time a goal was scored, FALCON FLOWER searchlights created a multi-beam flower effect. Players’ Night as well as the closing ceremony were also magnificently staged affairs. 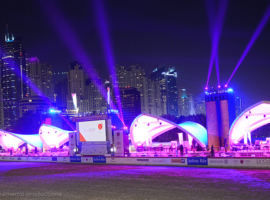 For the overall lighting choreography, FALCON BEAM 7,000W, FALCON FLOWER 7,000W, SKY FALCON ARC colour 1.200W and FALCON CMY LED-VIDEO LED/xenon hybrid searchlights were used — the latter contributing to the lighting design now as searchlights, now as video banners. 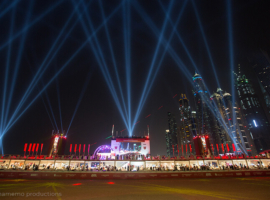 As well as sporting excitement, the jubilee event therefore provided spectators and players alike with memorable visuals in the form of high-tech lighting wizardry. 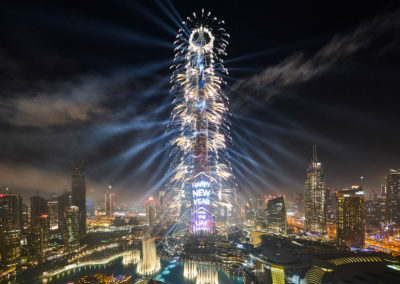 The creative and lighting concept was the work of mamemo productions led by Creative Director Sam Katiela with his team Sonu A.B. 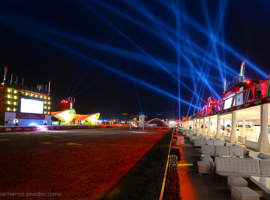 (Executive Lighting Designer) and Steve Chapman (Operator) supported by A&O Creative. 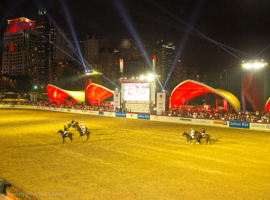 It was in Dubai in the Arabian Gulf in 2004 that beach polo was born. Now the game is played in over 30 cities worldwide. 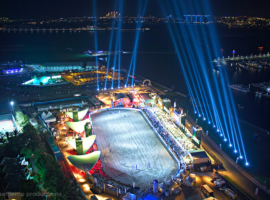 The custom-designed Beach Polo Arena at Skydive Dubai is the largest of its kind in the world. 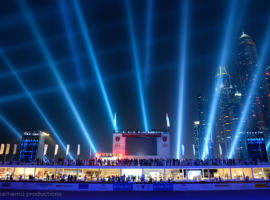 The Julius Bär Beach Polo Cup Dubai took place on 11-12 April. 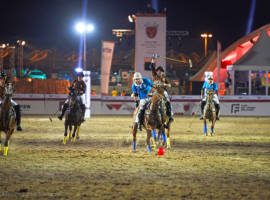 After a thrilling duel in the final, Mohammed Al Habtoor and his team VistaJet Bombardier succeeded in dethroning defending champions Julius Bär, led by his brother Rashid, to lift the trophy. 2015: Creative & lighting concept developed by mamemo productions under the direction of Creative Director Sam Katiela, Realisation of the creative and lighting concept by lighting designer Sonu A.B.